The mother of all eyeshadow palettes to take your eyes from a subtle sculpt for the day to strong, smokey nights. Featuring 12 highly-pigmented complimentary warm and shimmery shades, ranging from a .. The NEW Fix Stix Blush adds a lightweight, dewy pop of color to your complexion for a natural-looking healthy glow. .. Create the Ultimate Glow with the NEW Fix Stix Glow. With an easy and buildable application, this creamy formula blends smoothly onto your skin. 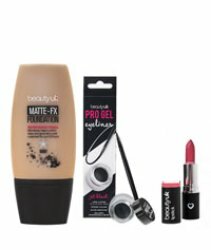 Use with Fix Stix Blush and Fix Stix Definition t..
Instantly refresh and hydrate the skin whilst keeping all the benefits of a primer with this convenient primer mist. Containing glycerine, known as 'makeup glue' by all in the beauty world, thi..